Downtown DC is considered the center of the nation’s capital because of its close proximity to popular attractions, a wide range of cultural experiences, national retail chains and noteworthy dining options. DC’s cosmopolitan downtown neighborhood offers a mix of in-demand restaurant options, high-end shopping and plenty of must-see museums. The city’s most famous address, 1600 Pennsylvania Avenue, is nestled on the border of downtown DC, giving this chic neighborhood an air of importance and sophistication. Downtown is a bustling center for business, dining, shopping and nightlife. Every day and night of the week, locals and visitors alike fill the neighborhood’s popular restaurants, shop the luxe labels at the retail and dining destination, CityCenterDC, and explore some of the city’s most famous museums, including the Smithsonian American Art Museum's Renwick Gallery and the National Museum for Women in the Arts. The walkable neighborhood is adjacent to popular Penn Quarter and most locals consider the two areas some of the best bets for meeting up with friends for happy hour or dinner. Fashionistas will find themselves in retails heaven at CityCenterDC. The destination lets you create a movie montage shopping spree fantasy with label after label – including Paul Stuart and much more – lining the airy avenues. There's also the luxurious Conrad Washington, DC, where Top Chef alumni Bryan and Michael Voltaggio are making diners rethink seafood at Estuary. One of the new kids on the block is Eaton Washington DC, a hotel that goes well beyond the standard definition. Besides its 200-plus rooms, Eaton is home to a radio station, a 50-seat cinema, and four food and drink concepts, including the highly Instagrammable Kintsugi – a coffee shop-juice bar hybrid – and American Son, the all-day restaurant from acclaimed chef Tim Ma. For foodies looking for a special night out, restaurants like Plume, Decanter and Zentan offer decadent dishes and distinguished wine lists. Post-dinner, locals love to sip cocktails at POV in the W Hotel. The year-round rooftop lounge boasts the best view in town of the White House. If it's brunch you fancy, head to Georgia Brown's for a Sunday jazz brunch that won't disappoint (there's a reason they were named one of Open Table's 100 best brunch restaurants). Brushing elbows with politicos at Off the Record bar, Old Ebbitt Grill's two-a-day oyster happy hours, food trucks on weekdays outside Metro Center, McPherson Square or Farragut Square. 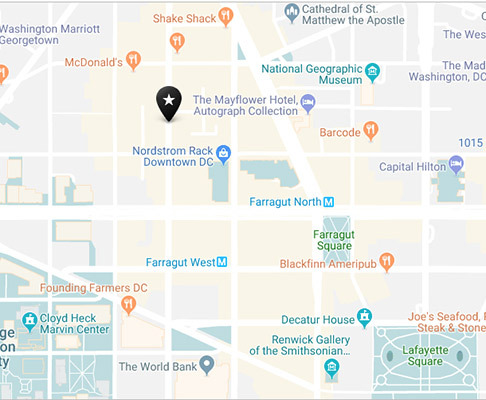 There are several Metro stops that will put you in the heart of downtown, including McPherson Square, Metro Center and Farragut West on the Orange, Silver and Blue lines (Metro Center can also be reached via the Red line) and Farragut North on the Red line. The DC Circulator’s Georgetown-Union Station route has several downtown stops along Pennsylvania Avenue. In the warmer months, Capital Bikeshare is also a great option for zipping around Downtown. There’s always something new happening in Downtown DC. Whether it’s a new business opening up or a favorite restaurant adding to their menu, find out what’s new downtown by clicking below.